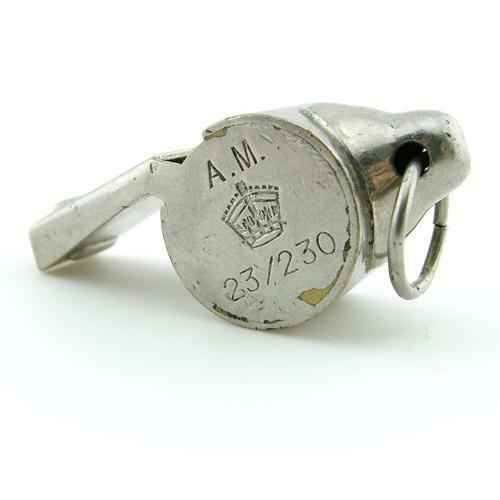 The classic 'snail' whistle often seen hanging from the 1941 pattern Mae West or aircrew blouse. Chrome plated brass. Air Ministry King's crown markings and reference numbers '23/230' to one side with further reference numbers to the reverse '293/14/L1795'. Some minor loss of plating (looks worse than it is in the photographs) but in good '+' overall used condition. Please note that the hanging ring is not original. There are now numerous fakes on the market, some very convincing. We guarantee this to be an orginal period item and not one of these copies. Stock code MW20260.